In opening statements the prosecution began by playing an expletive-laced audio tape of George Zimmerman from a taped call he made to police, while the defense began with a knock-knock joke, then later apologized. Zimmerman has pleaded not guilty to second-degree murder in the shooting death of Trayvon Martin. NBC's Ron Mott reports. A Florida judge will decide Tuesday whether calls George Zimmerman made to a police dispatcher in the months before he killed Trayvon Martin can be admitted as evidence. A jury on Monday afternoon heard one of the calls to a non-emergency police number, in which Zimmerman previously reported a suspicious person in his neighborhood — before the defense objected and said it was irrelevant. Prosecutors said the prior calls would give the jury insight into Zimmerman’s state of mind when he encountered Martin in a gated community of Sanford, Fla., on Feb. 26, 2012. Judge Debra Nelson called a recess in the trial to give both sides to prepare arguments about whether the jury can hear and consider the calls in deciding Zimmerman’s fate. While the defense contends that the prior calls have nothing to do with the issue at hand, prosecutor Richard Mantei said the calls support a case about Zimmerman's state of mind -- important for proof of second degree murder, which in Florida requires proving a so-called "depraved mind." Trayvon Martin on February 18, 2012 in a photo taken at his mother's birthday party. Martin was killed on February 26, 2012. Zimmerman, 29, has pleaded not guilty to second-degree murder in the shooting death of Martin, 17. His trial began in earnest Monday with opening statements and a few witnesses. Prosecutors say Zimmerman profiled Martin, followed him even after the dispatcher told him not to, and then shot him at such close range that it left burn marks on his sweatshirt. The defense says Martin was the aggressor in the confrontation, straddled Zimmerman and slammed his head against the pavement – putting him in fear of his life before he fired his 9mm. The call that Zimmerman made to a non-emergency dispatcher just after 7 p.m. on the night in question was played repeatedly for jurors, who listened intently and took notes. On the call, Zimmerman reports that Martin is walking around in the rain and looks like “he’s up to no good,” then says the teen is staring at him and approaching with his hand in his waistband. Under questioning Monday, Noffke said he didn’t order Zimmerman to stay put because dispatchers are only supposed to make suggestions for liability reasons. Under cross-examination, he said that when he asked Zimmerman which way Martin was running, he didn’t expect him to give chase, but allowed that someone could misinterpret his words. "There was no need for him to follow and no concern for his safety” because Martin had left the immediate area, Noffke said. In their opening statements, the prosecution and defense gave starkly different accounts of how and why Zimmerman shot Martin during the confrontation. "George Zimmerman is not guilty of murder. He shot Trayvon Martin after being viciously attacked," said defense attorney Don West. 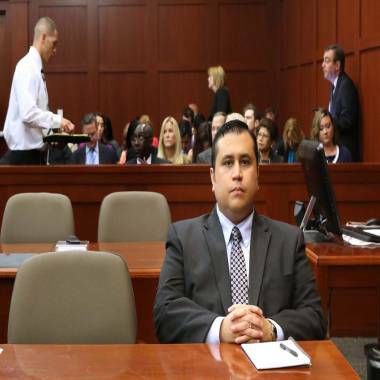 George Zimmerman waits for his defense counsel to arrive in court on Monday. Prosecutor John Guy said the evidence does not support a self-defense claim. “George Zimmerman did not shoot Trayvon Martin because he had to. He shot him for the worst of all reasons – because he wanted to,” he said. “These a------- always get away,” he quoted Zimmerman as saying. He said another call – this one from a neighbor who dialed 911 after hearing a commotion. – would support the prosecution’s charges. “In the background, you will hear the gunshot that killed Trayvon Martin and you will hear screaming in the background. Listen carefully, please, to that call and listen carefully when the screaming stops. It’s right when the gunshot goes off. 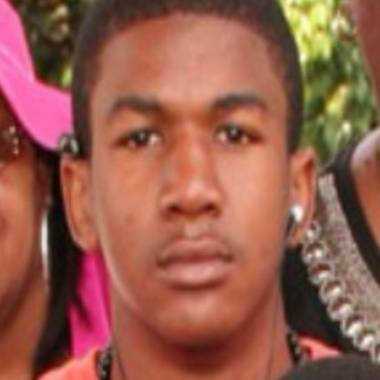 Trayvon Martin was silenced immediately when the bullet the defendant fired was shot through his heart,” Guy said. “If I’ve heard it once, I’ve heard it a thousand times, that Trayvon Martin was unarmed,” West said. Editor’s note: George Zimmerman has sued NBC Universal for defamation. The company has strongly denied the allegation.